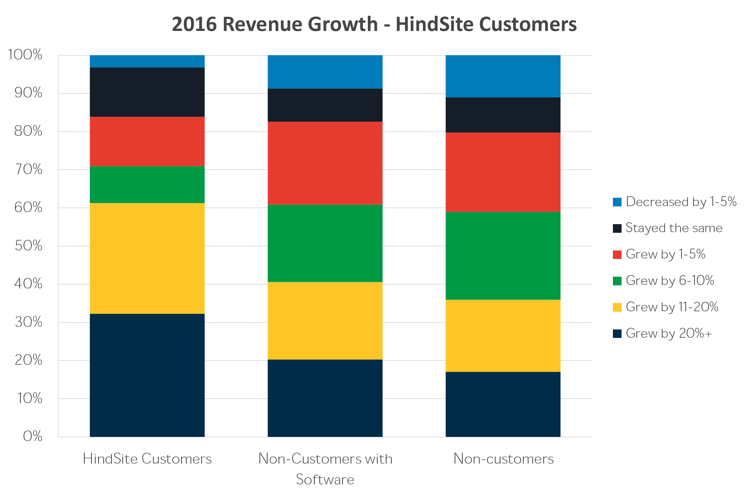 For the past five years, HindSite Software (www.hindsitesoftware.com) has been conducting an annual comprehensive survey of green industry businesses. We analyze and cross-reference the data, and then release what we call the Green Industry Benchmark Report. We ask questions about virtually every facet of their business to create the most comprehensive look at the green industry available. From hiring, to revenue growth, to sales and marketing - we analyze every aspect of a typical green industry business. It’s difficult to separate what’s happening politically in the United States from the outlook for a typical green industry business . Our first lesson reinforces that: respondents are optimistic about the Trump economy. 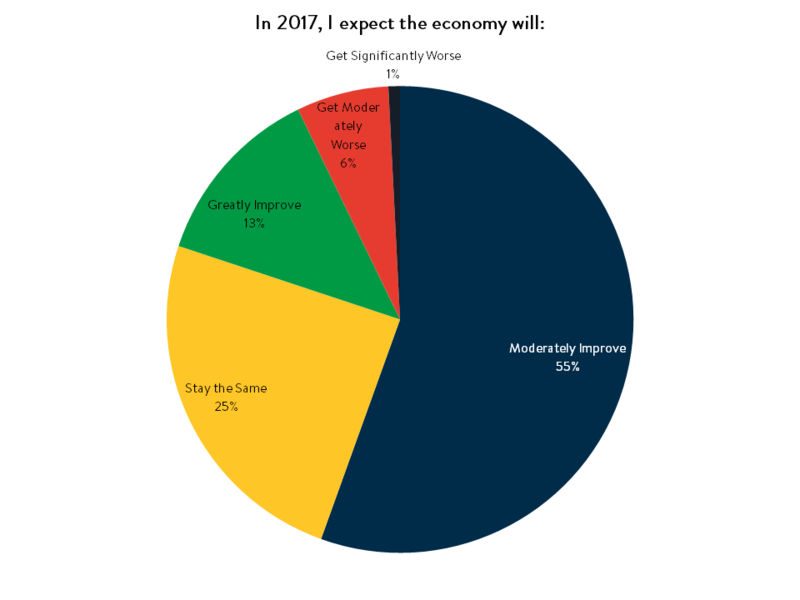 Consider that 55% expect the economy to moderately improve, 13% expect great improvement, and 25% expect the economy to stay that same, which means just 7% of respondents expect the economy to worsen this year. Last year we found 46% expected the economy to moderately improve - and just 2% expected it to greatly improve. 12% thought it would worsen. So economic optimism has increased. Politics does play a slight role in this. 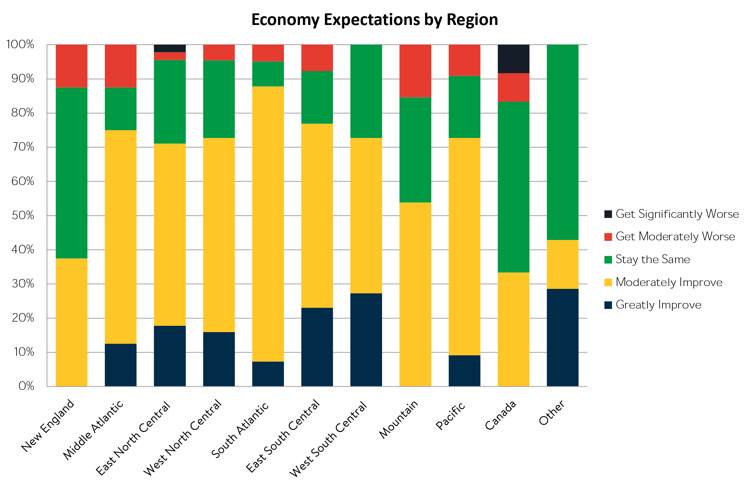 When we look like the economic expectations by region, it shows that conservatives strongholds in the south were much more optimistic than their liberal counterparts in New England. Still, optimism is up, regardless of political leanings. It’s likely that you’re going to continue to be busy. This report confirms what a lot of other surveys have shown - that businesses and consumers are generally optimistic about the economic improvement in the United States. Part of the reason green businesses may be optimistic is because 2016 was such a good year. 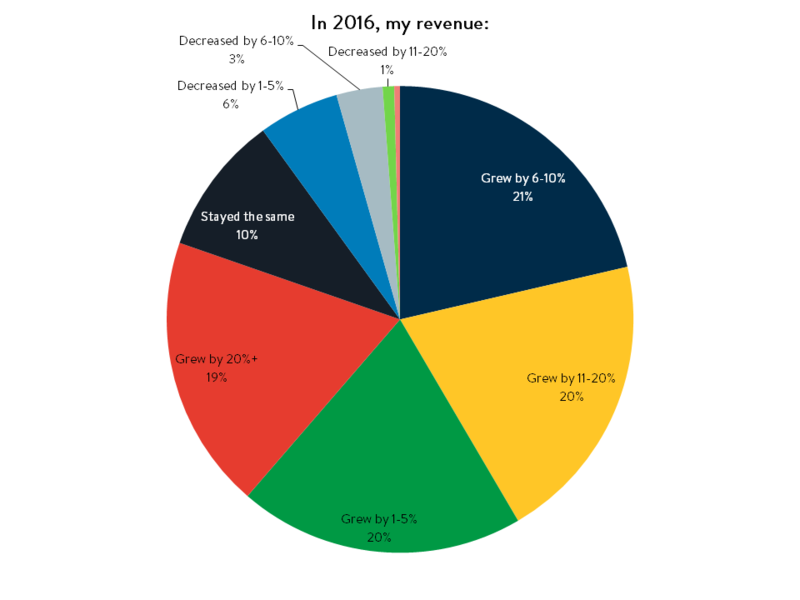 80% of respondents saw revenue grow in 2016, roughly the same as 2015. Though the high-end 20+% growth was down slightly from a year ago, it was still generally a good year for most green industry businesses. There seems to be strong demand for green industry services. Anecdotally, I’ve heard from many of our customers that there’s enough work out there for everyone. They’re no longer worried about not finding enough work, but now they’re worried about finding enough people to do the work. Attracting and retaining employees was the #1 issue cited by green industry businesses, with 27% saying it was their biggest issue. 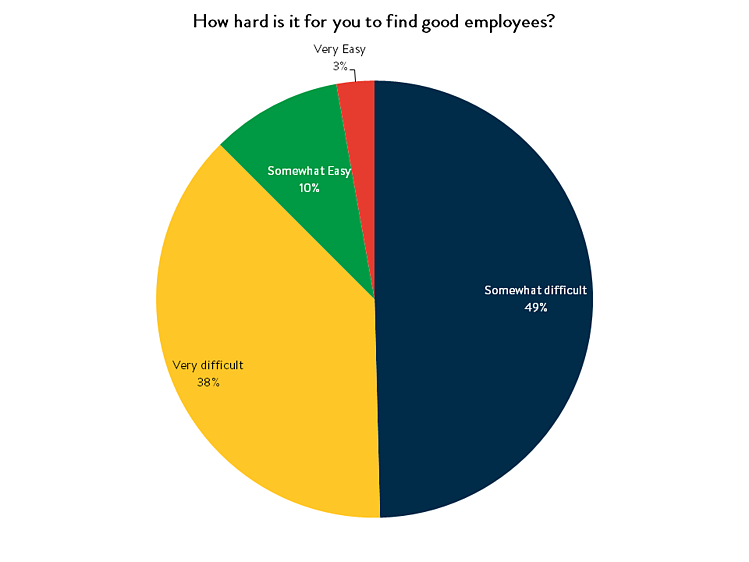 49% said it was somewhat difficult finding good employees, while 38% said it was very difficult finding employees. Just 13% said it was somewhat or very easy. Last year, 79% said it was somewhat or very difficult, so it’s up 8% year-over-year. And if the economy does improve and we experience job growth, expect it to become increasingly more difficult to find employees. 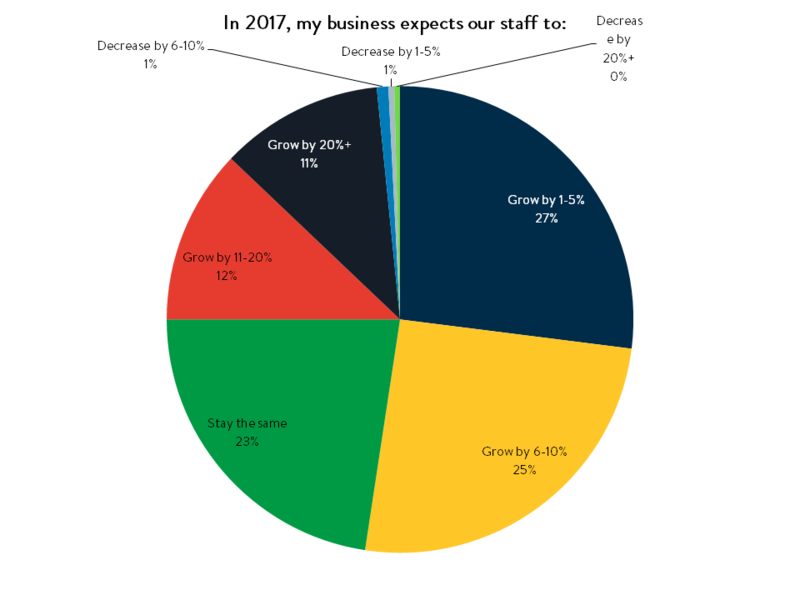 The even scarier part - the vast majority of businesses expect to grow their staff this year. 75% expect to grow their staff in 2017. In a competitive marketplace, that’s going to be very difficult. So how do you overcome a labor shortage? Always be hiring. Don’t wait until you need the staff to be looking for staff. I’d keep help wanted information on your trucks, in your storefront, on your website, and even on customer facing documents like invoices and estimates. Build the infrastructure to hire before needing a body is a requirement. Find ways to be more productive without hiring staff. That may mean investing in equipment that enables you get more work done. If you own a lawn maintenance business, it may be a lawn mower with a better production rate. If it’s an irrigation business, maybe a trencher that can save you time. But equipment isn’t the only way to improve productivity. Software can also help. We’ve talked to irrigation businesses that were thinking of hiring another office manager to handle the load, but instead installed HindSite and found that not only did they not have to hire more office help, but they also freed their existing office staff to work on other projects. There are tons of little ways software can save you time that add up to big savings. It’s a relatively small expense - and in most cases a lot less expensive than hiring someone. Examine your training. We’ll talk a bit about this later, but frequent training can not only make your team more productive, but it can also help you retain employees. So consider how you train your employees. Ask your staff how they felt training went. What could have been improved. Figure out what they struggled to do in their first days, weeks and months on the job, and put together a plan to improve your training. 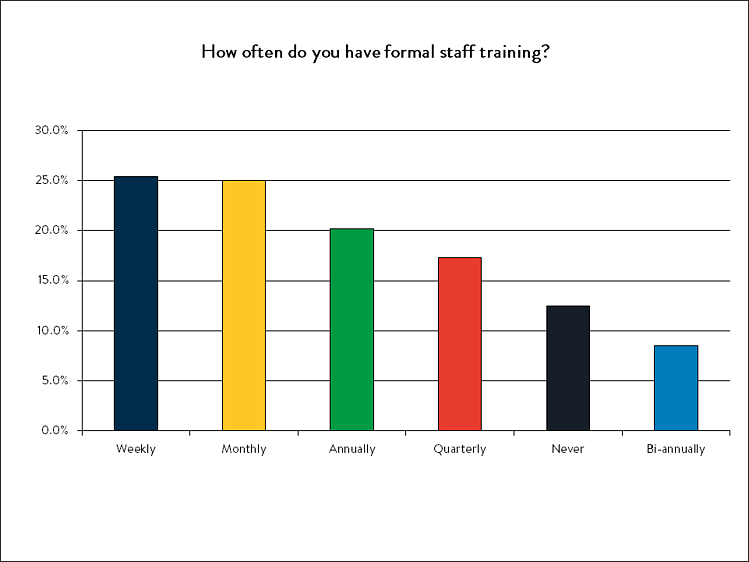 When I examined the data, I found that about a quarter of businesses do weekly training, which is great, but almost 15% don’t do any training at all. Which got me thinking - does the frequency of training matter? It sure seems like it does. Those whose profitability was in excess of 20% were generally training more frequently. 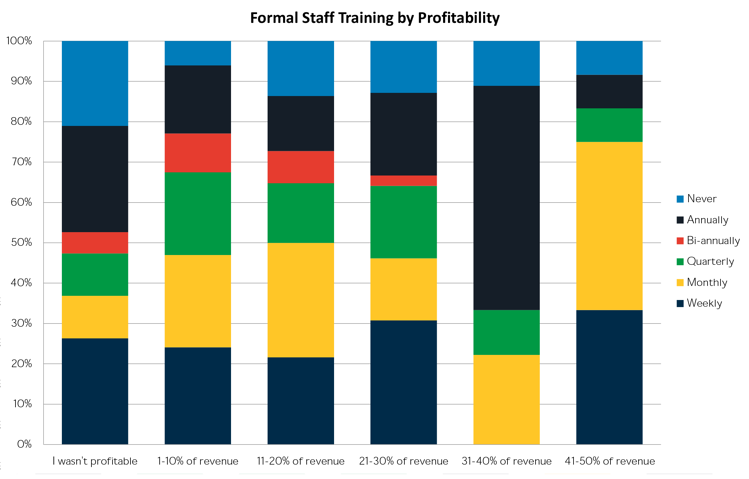 And those who saw low profitability - especially those that weren’t profitable - generally were less likely to to offer training - and more likely to be less frequent in their training. Training doesn’t have to be formal. A simple weekly 15-minute meeting where you discuss issues from the previous week - and how to solve them - is a great way to improve your employees. Think about doing quality control checks. A number of our customers use what we call assessments to perform quality control checks. This is especially effective in maintenance businesses. Simply send a manager to a property once a month for a review. Arm your manager with a checklist or document with a series of questions that rate the quality of the work. Collecting that data gives you information you can use at your weekly training sessions to teach your employees how to do the job. You don’t always need to be the one training. Have your employees teach each other. It’s a great way to get them involved in the training. At HindSite, we’ve been practitioners of the Entrepreneurial Operating System outlined in the book Traction for a couple years. One of the first things it teaches is the importance of goal-setting. Though they use slightly different terminology, you’re basically setting quarterly, annual, three year and ten year goals. So goal-setting is deeply ingrained in our business. And, judging by the evidence, it should be in yours, too. 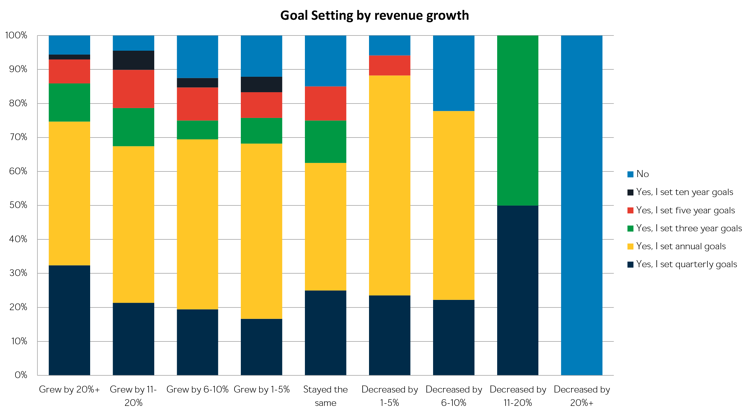 Generally, most green industry businesses are setting annual goals, but very few are setting three, five or ten year goals. Does it matter? The answer seems to be yes. Of the businesses that grew more than 10%, none of them didn’t set goals. They were also much more likely to set quarterly goals. So set goals. Short-term goals are great, but you also need long-term goals. Setting a ten-year goal is the first thing any business should do. Then, break that ten-year goal down into shorter and shorter segments. 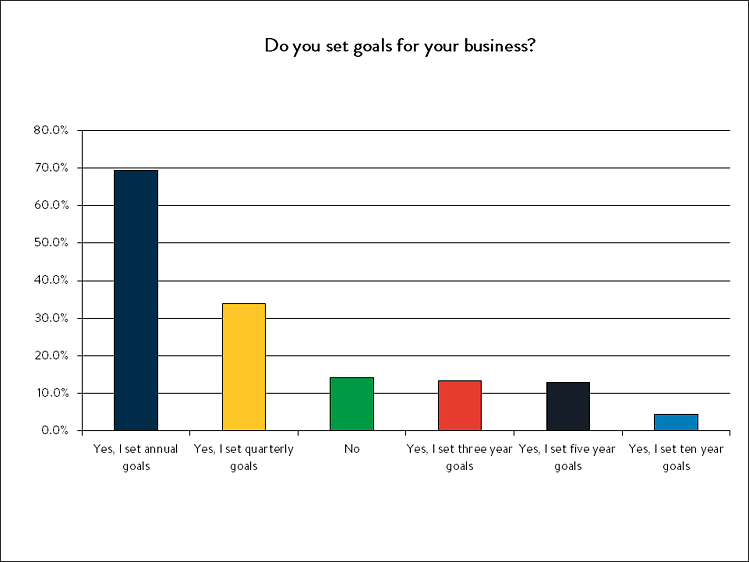 So your quarterly goals should roll up into your annual goals. Your annual goals should roll up into your three and five year goals. Which should all help you achieve your ten-year goal. My other piece of advice: In addition to setting a numerical goal, also set activity goals. For example, if you want to increase your revenue by 10%, what activities do you need to do to make that happen? Is there a marketing activity that needs to happen? Do you need to hire a sales rep? Do you need to do some referral or upselling campaigns to customers? Setting a target to increase revenue by 10% year-over-year is a great goal, but make sure your quarterly goals include activities that help you achieve your annual goal. Focus matters. That’s why I think setting short-term and long-term goals are important - they help you focus on what you want to achieve long-term and then set short-term goals that incrementally help you get there. Another way to boost your growth is by using online advertising. 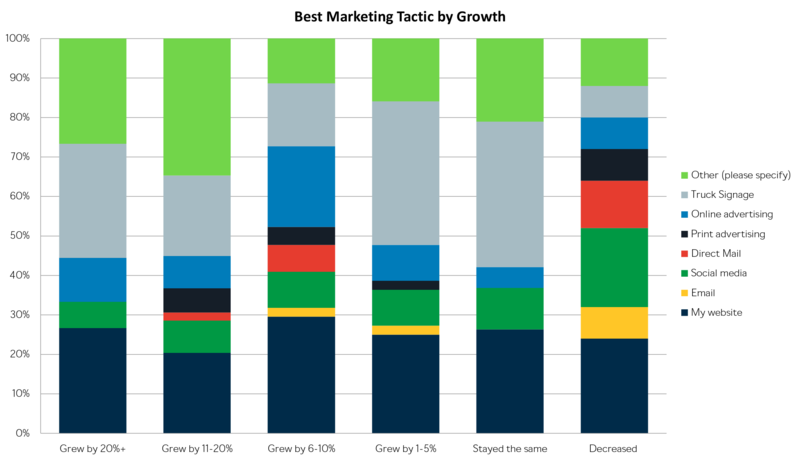 Businesses that grew by more than 5% seemed to be more likely to indicate that they used online advertising. Which makes sense - online advertising can be a good way to generate more leads and thus more sales. Angie’s List - We have a customer who swears by Angie’s List. He says he gets all the leads he needs to grow his business by paying for a top ranked Angie’s List listing. He said it consistently shows ROI. Google Adwords - I talked to another customer recently who found that he could spend 10 cents per click for Google Adwords and he’d rank #2 or #3 for targeted keywords that drive a lot of revenue. He said for $3 to $4 a month, he could get more than 100 leads, many of which converted to sales. Why? Because he wasn’t concerned with ranking #1 for these keywords. The manufacturers were #1, but if he was #2 he could get all the traffic from people searching for an actual contractor. Your mileage may vary depending on the competition in your market, but if you can find the right keywords, you could generate some new leads and sales at a minimal cost. Social Media Advertising - Facebook makes it easy to target specific groups of people. You can target neighborhoods that you’re already in, so every lead is as profitable as possible. HomeAdvisor - I’ve heard conflicting results on HomeAdvisor. Some people say it’s great, some don’t. A lot of your success may be based on whether your local area generates a lot of new requests. Your primary service may also play a role. Online advertising can be turned on and off relatively easily, so if you’re struggling to generate new leads, turn it on for a few months. If you find that you have an overabundance of leads, turn it off. It’s a great way to level out the peaks and valleys in your lead flow. The last lesson is probably the most important one: Software matters. 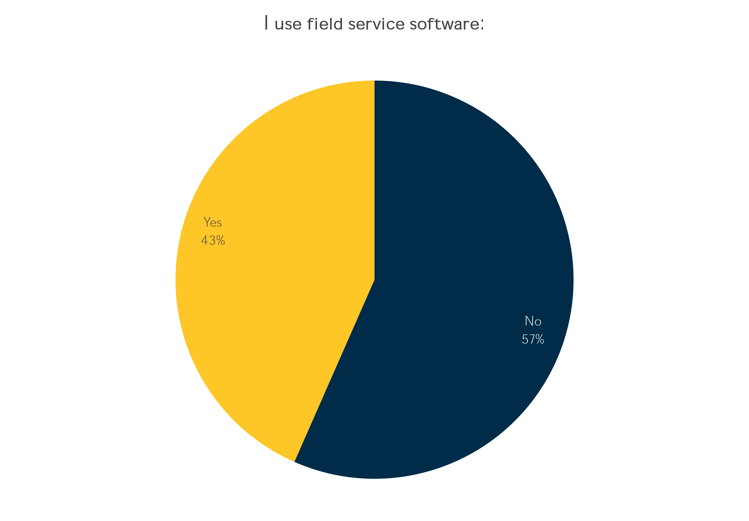 We found that 43% of respondents are using field service software, and generally, if you have more than 20 employees you’re likely using software. More importantly, those that grow fastest are more likely to have software than those that don’t. Why? 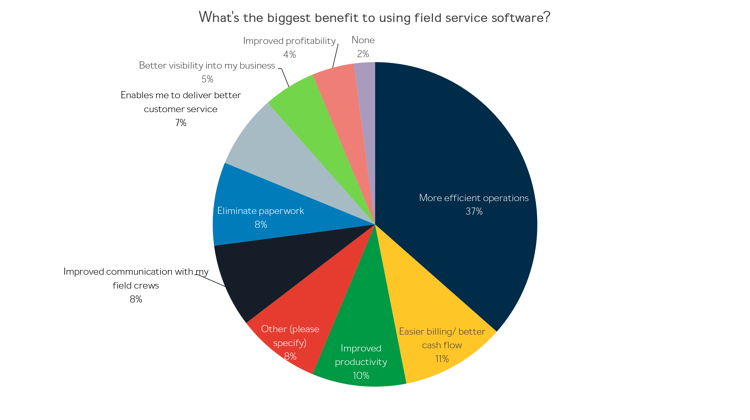 The number one benefit of software according to survey respondents is that it delivers a more efficient business, which is probably obvious. But responses like easier billing, improved productivity, improved communication, better customer service, etc. There are a lot of benefits to using software. Software matters. And, interestingly enough, the software you choose also matters. We’ve conducted this report for five years. For the past three, I’ve analyzed how HindSite compares. And every year I’ve found that our customers outperform everyone else. So if you’re not using software, you’re at a competitive disadvantage. I’ll close with an illustrative story: We recently talked to a prospect in Florida who called us to learn more about what we do. They asked if we had any customers in their area and we gave them the name of one of our customers. We could see the light bulb go off. They told us that they’d always wondered how that competitor was able to undercut their prices. They realized it was because of software. The prospect had 1 manager for every three field employees because of all the paperwork that was generated during their typical operation. Our customer had 1 department manager for 11 field staff. They were more efficient, were able to pass on those efficiencies to their customers, which in turn generated more business. Want to learn more about the 2017 Green Industry Benchmark Report? 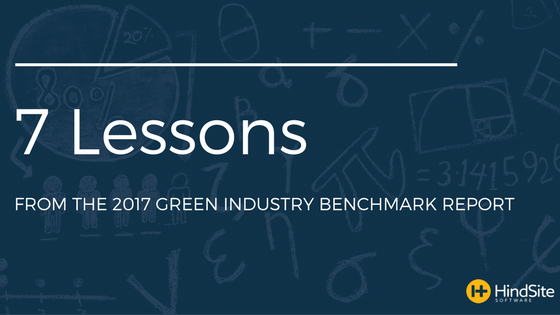 Download it at: http://info.hindsitesoftware.com/2017-green-industry-benchmark-report or watch a free webinar, 10 Lessons from the 2017 Green Industry Benchmark Report at http://info.hindsitesoftware.com/10-lessons-from-the-2017-green-industry-benchmark-report.